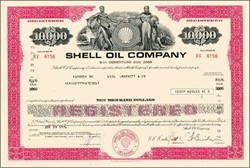 Beautifully engraved certificate from the Shell Oil Company issued in 1979. This historic document was printed by the Security-Columbian Banknote Company and has an ornate border around it with a vignette of an allegorical man and woman standing next to the company logo. This item has the printed signatures of the Company�s President and Secretary and is over 29 years old. Organized into five core businesses - Exploration and Production, Oil Products, Chemicals, Gas and Power, and Renewables - Shell companies operate independently, although they draw on a common network of service companies and comply with one and the same set of business principles. The service companies provide a range of specialist advice and resources, and the principles ensure that all companies perform to the same high level in the economic, environmental and social domains. Each core business is headed by a chief executive officer with broad overall responsibility. The CEOs report to a Committee of Managing Directors made up of the executive directors serving on the Boards of the two listed Parent Companies: Royal Dutch Petroleum Company and The "Shell" Transport and Trading Company, p.l.c.